I’m trying to keep the posts in step with the paintings. For me, the paintings are the easiest, and least time consuming part of the process. Its the other stuff, video, editing, photography which are a pain. Writing the post shortly after painting the picture is good, as issues are still fresh in my mind and I can just rattle them off. I had a request to produce a ‘real time’ as opposed to ‘time lapse’ (which I do) version of a video. A feature length movie is a time consuming business to deal with. For a start, it takes an hour and a half just to look and see if it is OK. Processing the final video also takes hours. This is what put me out of sync. Anyway, I really can’t see how anyone could endure one and a half hours of a brush applying paint to a canvas. Think of all the movies you’ve seen that lasted an hour and a half. Private Ryan was saved and brought home to mammy, in an hour and a half, Oh for God’s sake, Middle Earth was saved in an hour and a half. You can also travel to a galaxy, far, far away in an hour and a half. My brushes, blonde haired beauties as they are, may look and behave admirably, but they are not the stuff of feature length movies, as yet. Its just the technology does not allow this to be done conveniently and fast enough if you have other stuff to do, like look for subjects, think, look again, think and then paint pictures. What I’m trying to say is, the paintings have outpaced the posts, so I’m going to try and catch up. I did a painting today which I’m very excited about, but I can’t tell you about it until the photos are ready and I can’t do that until I finish this post. I would like to hear any views you might have on this, ‘real time’ versus ‘time lapse’, from the point of view of sharing the experience and being helpful to other painters. Here is the video of the last painting, check previous post for more info. on materials etc. 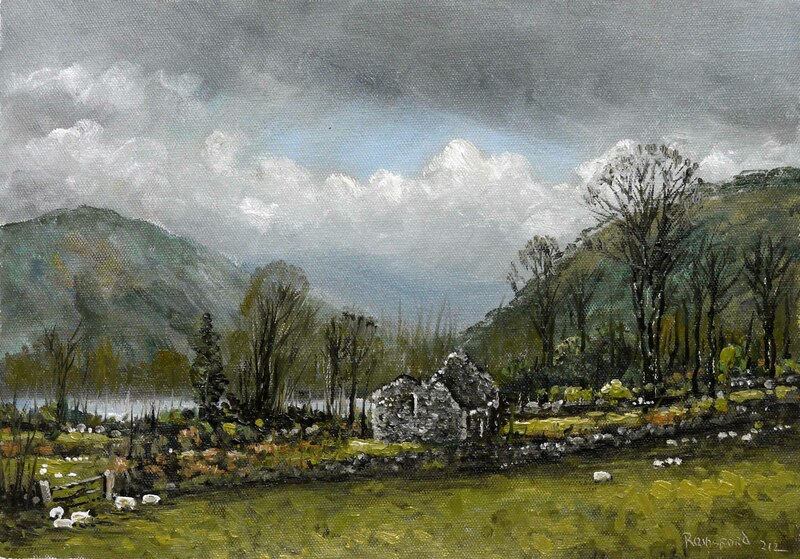 This entry was posted in Oil Painting and tagged Art, Culture, Education, Inspiration, Irish landscape, Oil Painting, Oil Painting Instruction, Oil Painting Landscape, painting, Time lapse painting. Bookmark the permalink. Personally, I prefer watching time lapse as opposed to real time. If I’m looking through artists on Youtube, I only ever type in “time lapse”. As much as I love art, when watching the real time painters on Sky’s drawing and art channel, I find that I’m struggling to keep my eyes open. I agree. A couple of hours is only enjoyable for the painter. I’d go crazy if I had to watch anything for 2 hours 🙂 . I love the time lapses and deeply appreciate the information you take the time to share and post with us. I’ve a habit of happily enjoying a cuppa fresh coffee while enjoying your posts. I’m delighted you enjoy the 10 minute videos and am more than happy to share what I experience as I move from painting to painting. Appreciation makes it worthwhile, thank you. I think the limitations of technology will decide the outcome of this request. I’m conscious that ‘time lapse’ is used to study many things like traffic flows, or workplace practices, as extreme slowing of video is used to study other things. Thank you for your thoughts on the matter. Time lapse is definitely better! This is a lot of work, I agree with Bev, I’d rather be painting. Time lapse is fascinating, it allows us to see flow and pattern in a different way. I love the way the painting sharpens up in the last couple minutes. I also think time lapse is better, thank you for the comment. I forgot to say, thanks so much for going to the effort! I think the time-lapse is wonderful! A fantastic teaching tool. The paintings are beautiful and I’ve learned more about landscape painting by watching you paint. As a portrait painter, composition is my weakest point. Thank you so much for your extra efforts to teach us what we lack. I can, however understand the request for real-time. I wonder if there is a compromise. Does the technology exist to reduce an hour and a half down to say, 20 or 30 minutes? I would buy that video! I’m delighted you find the Blog Postings of benefit to your painting. The key factor here is time. I can afford the time to do a 10 minute video. I would have to employ a person to do the video work if I wanted to produce a ‘finished’ package, and I have absolutely no interest in going ‘commercial’. Producing a video of every painting from start to finish (even squashed to 10 minutes) shows an aspect of painting never before available in the entire history of art. The best part is, I can share it without the need to ‘sell’ anything. Artistic Utopia!, and long may it last. The way technology is going, in the not too distant future, I probably will be able to make available a video where the viewer will be able to chose how long, or short the playtime can be, and still not have to pay anything. Here’s to the future.